Track Shack - Be the July Customer of the Month! Do you enjoy running as part of a group or by yourself? Post on the Track Shack Facebook page or on the blog. Deadline: June 20th. This past month, you all shared quite a variety of songs that get your feet moving when you hit the pavement for a run. We received so many great responses, we will release a list of the submitted songs in the next couple of weeks. From country to heavy metal to pop and everything in-between, you run harder and faster and more focused when that favorites song is playing. Heather Flores (pictured on right) picked a popular favorite, “Don’t Stop Believing,” as her favorite song because it has a great beat and the lyrics push her when she is close to the end of a race when that inner voice is telling her that she should just quit (we all know what that voice can sound like). She shared this photo because it’s with her best friend, Melanie, who inspired her to become a runner. I love running with a group but I rarely get to do so. My work schedule is constantly fluctuating so I have to cram my runs in at odd times of the day. This makes me a solo runner most of the time. That is why I so look forward to local races sponsored by Track Shack. Orlando has such a great running community and they are so supportive that I feel like I am running with hundreds of my best friends. Honestly, I run more by myself, but I appreciate it so much when I get to run with other people! I have a very busy schedule, so it's hard for me to find time to meet up with other people. Running alone really does take a lot of motivation within yourself, but I feel thats what makes you stronger. But the times I am fortunate enough to meet up with some friends, it makes it for a great, fun run! Which I think every runner needs those fun runs to keep the mind relaxed during training. 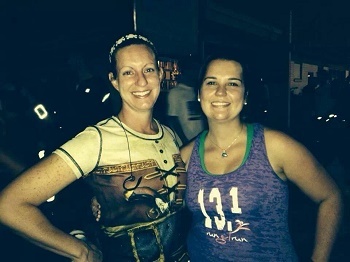 I started running with my friend Jen almost a year ago. In that time she has pushed me so hard that I have shaved significant time off of my short and long distance races. We truly motivate each other! As full time teachers and mothers of two (each), our runs have been not just physically beneficial, but mentally theaputic! My profile picture is of the two of us on a race we did together the day before Mother's Day. We came in 1st and 2nd! I prefer to run as a group! This past October I started running again. Unfortunately, most of my running friends live to far to run with. For safety reasons I always try to run at places where I know I will run into other runners/walkers. I have also tried to sign up for as many races as I can because I love running with other people. The energy is so positive! This past week I started Marathonfest Training and I love it. I signed up for my first marathon and knew I would have to get up early to get the long runs in. Running with a group keeps me motivated and helps me stick to a training plan. I run because I am a Mom, Wife, Sister and Friend. I work full time and found that running helps me clear my mind and rejuvenates my spirit. Some days are harder than others, but after each run I feel clearer. Both my daughters ages 4 and 6 ran their first 5k last month and are hooked, happy running! I love running by myself early in the morning before the sun comes up, usually quiet and peaceful. I then have the rest of the day ahead of me and I have started it in a very positive way. I love both, running on my own, getting in sync with my own body, getting that perfect pace, but I love the 5k's pushing myself against others. I like both ways. 20 miles by myself is too long so I enjoy the company and support of my running group. I do enjoy shorter runs by myself as they are the time to concentrate on just me and my running, no real distractions. Both. Long runs on the weekend are safer and more fun with friends. Shorter weekday runs are for me to focus on hitting goals and being alone with my thoughts. I love to run by myself.............it is my "me" and quiet time. Concur with Megan's comments. Training solo allows for more flexibility, and being the introvert that I am, I find the solitude comforting. But on race day, the more support, the better. I love running by myself while I'm training to try and beat the clock, but running as a group during a race is motivation to not give up. I do not like to run alone it doesn't nesisarly have to be a large group but I prefer to have at least 1 other person running with me because bit helps to keep me going and motivated when one starts to fall the other is there to in courage and push you to keep going.